Triumph haven’t broken the mould; this isn’t a huge step forward for the already excellent Tiger 800. It’s smooth and more accessible, mainly due to new technology and riding aids. It’s comfier than before thanks to a new seat, a larger manually adjustable screen, heated grips and bars, even cruise control. The new TFT dash, back-lit switch gear and new graphics give it high level of spec for a middle-weight adventure bike. 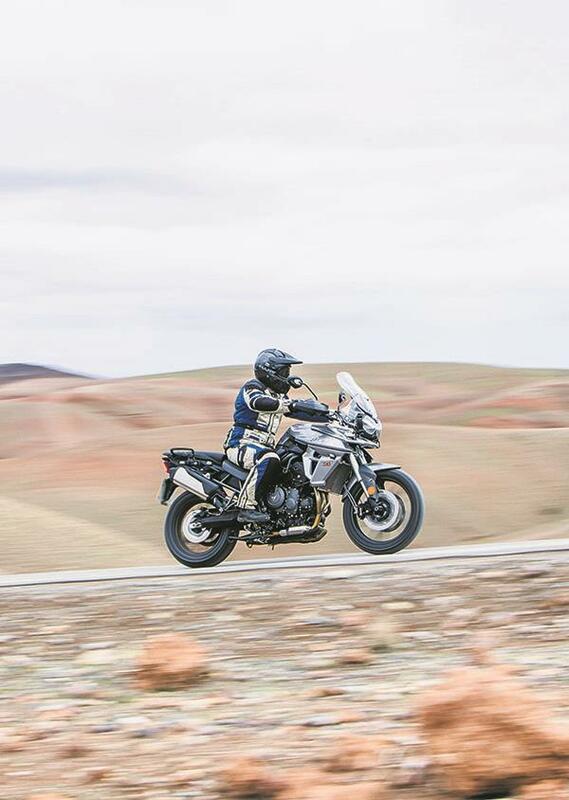 The Tiger is so impressive it makes you wonder why you would want anything larger, especially when you consider that it’s taking on pricier big capacity adventure bikes head-on at a tempting £12,050. New Brembo stoppers were strong enough and up for the job. 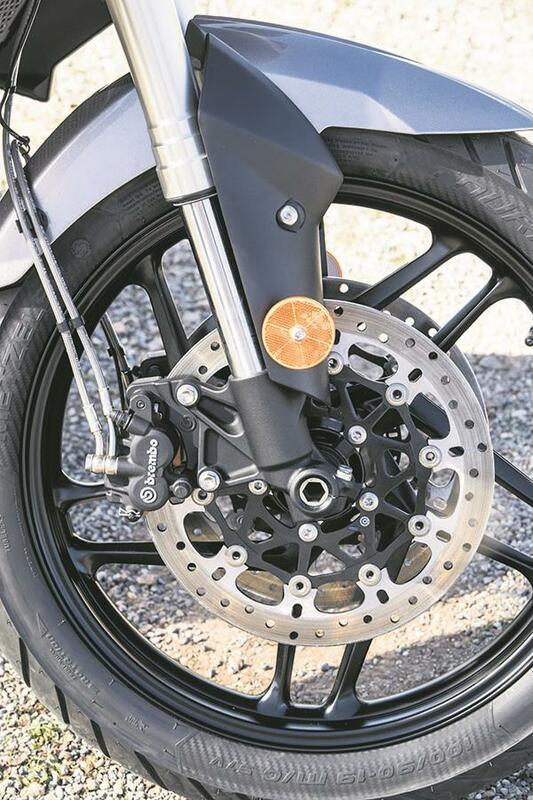 The ABS is conventional and not lean sensitive but under heavy braking the 43mm new Showa forks offer excellent support, and don’t plummet into the road like some adventure bikes do. The handling is impressive, too, for this type of bike though at a quoted 208kg dry with an estimated wet weight of around 230kg the Tiger is certainly a middle-weight and not a light-weight. The three-cylinder engine is the primary source of the kilos and is carried slightly high in the chassis and, while you’d never describe the Tiger as agile, but it’s responsive yet stable. Despite the road biased Metzeler Tourance tyres we even attempted some mild off-road on the XRT without drama, my only grumble being that you can’t change into the ‘Off Road’ mode or turn off the TC or change the ABS on the move. It’s a little annoying having to stop and re-set the TC or ABS every time you hit some mild gravel. 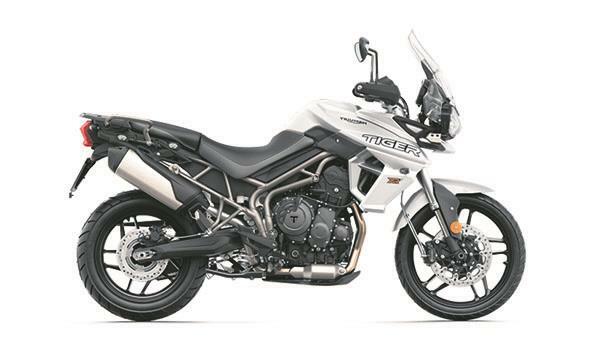 At the heart of the Tiger is the sublime 800cc in-line triple. For 2018, capacity remains the same, as do the majority of the internals. Triumph claim they’ve ‘optimised’ the engine, and it now features a shorter first gear to improve responsiveness and acceleration and a lighter exhaust with a ‘better’ sound. Peak power of 94bhp and torque at 58ftlb are identical to the previous model, however both peak slightly higher in the rev range, while Triumph will also be offering an A2 kit for all 800 models. On the top of the range model the level of finish and quality feel is premium. Brembo brakes, adjustable Showa suspension, multiple rider modes and rider aids, plus a full-colour dash gives the middle-weight adventure bike a top-level feel. The engine and chassis is based on the already proven Tiger 800, therefore reliability shouldn’t be a problem. Triumph have catered for every budget, with the base model starting at just over £9000 – but it’s very basic. 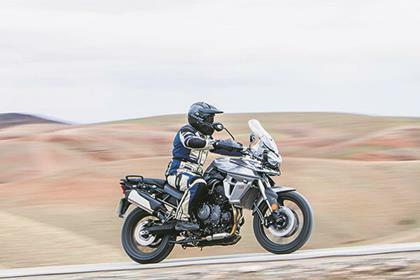 The bike tested, the £12,050 XRT is their premium model, it come fully-loaded but is nearly the same price of Triumph’s Tiger 1200 - starting at £12,400. There are four rode models to choose from, all run a 19in front wheel and Metzeler Tourance rubber. Seat height are 810-830 unless otherwise stated. XR £9100 – The base model, with LCD clocks, conventional lights, no rider modes, no cruise control, opt heated grips.  XRX £10,550 – Middle spec, day time running lights, four rider modes, heated grips, Brembo brakes, TFT clocks. XRX LRH £10,550 – Middle spec, but lower, day time running lights, four rider modes, heated grips, Brembo brakes, TFT clocks, 760-780mm seat height. XRT £12,050 – Top spec, back lit switch gear, LED and day time running lights, five rider modes, heated grips, heated rider and pillion seat, lighter alternator, adjustable Showa suspension, Brembo brakes, TFT clocks. Triumph have made a large step forward with their electronic riding aids and technology and the new bike features up to six riding modes with a specific ‘Off-Road Pro’ setting for the XCA. Each mode changes the engine characteristics plus ABS and traction control intervention. You can also personalise and save each mode, for example removing the traction control (TC) in Sports mode. 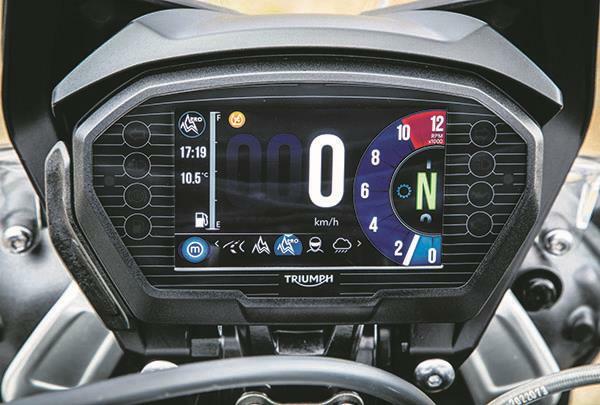 To navigate the new modes, there’s a neat new dash and switch-gear (although the base model still has a basic LCD display), but the mid and premium Tigers have an eye-catching full colour TFT display. The clocks are multi-adjustable -- you can change the layout and look -- plus the display pivots, allowing you to clearly see the screen stood up or sat down. The back-lit switchgear with a five-way joystick makes it easy and intuitive to navigate the new clocks. A clever and easy-to-use five-way manually adjustable screen is all-new as are the ‘aero deflectors’ either side of the new lighter headlight. The ergonomics are similar to the old model, but the bars have moved back 10mm while a new two-way position adjustable seat adds adjustability and there’s still and optional lower model (see above). To increase comfort further, the XRT receives a heated seat for both pillion and rider as standard, plus heated grips and cruise control. A 12v socket and USB connection are a welcome added bonus. XR £ 9100 – The base model, with LCD clocks, conventional lights, no rider modes, no cruise control, opt heated grips. Two off-road biased models l run 21in front wheel and either Bridgestone Battlwing or Pirelli Scorpion Rally rubber. Seat height 840-860. XCX £11,250 - Day time running lights, five rider modes, heated grips, adjustable WP suspension, Brembo brakes, TFT clocks. XCA £12,450- Back lit switch gear, LED and daytime running lights, six rider modes, heated grips, heated rider and pillion seat, lighter alternator, adjustable WP suspension, Brembo brakes, TFT clocks. No owners have yet reviewed the TRIUMPH TIGER 800 XR (2018-on).